Machine Learning is a subset of Artificial Intelligence that provides systems the ability to automatically learn and improve from experience without being explicitly programmed. It uses algorithm to enable computers to learn to do something they are not programmed to do. IBM, Amazon, Microsoft, and Accenture are implementing ML and driving innovation on large scales. With industries like transportation, manufacturing, energy, farming, and finance adopting ML, the growth in the job market for ML professionals is also tremendous. 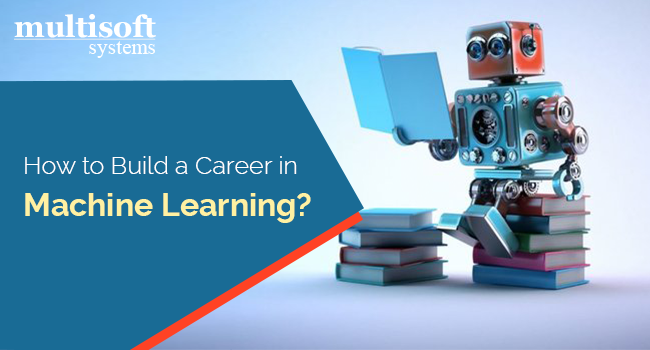 If you are working in this field or planning to, have a look at the career options you can explore after completing the Machine Learning Training. Machine Learning engineers need to have proper understanding of the entire ecosystem that they are designing for. To become an efficient ML engineer, you need to have knowledge of certain languages and libraries, like computer science fundamentals, probability and statistics, data modeling, applying ML algorithms and libraries, etc. If you think ML software engineer is the role for you, Machine Learning training can teach you to write software programs for different purposes, including operating systems, network distribution, and for converting programs into executable files. Knowing programming languages like Java, C++ and C will come in handy. A novice software engineer earns around $69,000 per annum. A software developer is responsible for creating the flow charts that are required by the coders to do their job. Software developers make sure that upgrades work properly, and they also provide documentation for the systems they build. Just like software engineers, software developers should have knowledge of statistics and probability as their job is to estimate the network structure’s underlying datasets for the purpose of finding patterns and predict the properties of unseen instances. The average salary for a software developer is $81,829 yearly. A designer of human-centered machine learning is responsible for developing systems that can process information and recognize patterns, like creating software for banks. Netflix hires ML designers to create an individual and ‘smart’ user experience. This job position pays an average of $97,000 per year. A data scientist uses information analysis to discover useful information through the process of inspection, cleaning, and modeling. Machine learning enables data scientists to produce accurate results and analysis by developing efficient and fast algorithms and data-driven models for real-time processing of this data. With experts predicting that 40 petabytes of data will be in existence by 2020, data science career opportunities will shoot through the roof. The average pay of a data scientist is $121,000. Computer linguists’ job is to help computers learn how to understand spoken language and to continually improve the systems that currently exist, as they frequently make mistakes. The aim is to help the machines actually comprehend language. A computational linguist’s average salary is approximately $91,000 per year. Multisoft Systems is an established training organization that provides various Machine Learning Trainings in Noida. Each training program is designed to target professionals coming from different job profiles. Their certified trainers make sure that you get a thorough understanding of the subject to excel in your respective field. What all you will get from Machine Learning Certification Training program?